The Crime of Julian Wells is an absorbing read and I truly enjoyed this introduction to Cook's work. 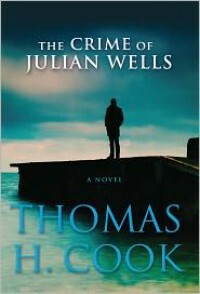 Cook masterfully weaves elements of Julian's past, his fervent belief that a father is the most important element in a child's life into a compelling and tense narrative that makes you consider the many angles from which Julian made such a spectacular misstep as the one that would cause him to take his own life. The novel is smartly written, and is a clever mixing of the history of infamous serial killers, the enigmatic nature of friendship and the fragile balance in maintaining dearly held beliefs. Phillip's examination into his friend's whereabouts and deeds also cause him to examine his own belief about friendship and hindsight cruelly illuminates his failures, far more than his successes.